I first picked up Sanity & Tallulah at BEA. It was on the middle grade buzz panel and I was intrigued. I had heard a bit about it, but not too much. Well I’m SO ecstatic I picked it up because I adored it. Can I tell you a secret? It’s the first BEA arc I read and I’m writing this review to you from the past – in June! This graphic novel will charm the socks off of you. I want posters of this, pins, and sequels. Not in that order though because I need to know there will be more before I lose my mind over the merchandise for this. Seriously new mega fan here. Where do I even begin? Do I start with the adorable friendship between our main characters? Or the diversity in the details? Or the fact that this middle grade graphic novel celebrates strong families, intelligent female scientists, and imagination? 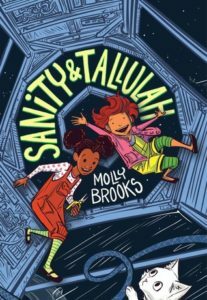 Sanity & Tallulah takes place on a spaceship and it’s in the best way. I love spaceships. I mean, that’s why I focus on SF. So when I say this is a great spaceship setting – this is a great spaceship setting. There’s wonderful science in the book without it hitting you over the head and without overwhelming you. The drawing style is just my cup of tea – not only are the colors both intriguing and calming, but the comic style is wonderful. It’s personable without it being childish. It’s charming, without it being sarcastic. There’s such a pure innocence to the drawing style. At the same time, there are hints of more world building, or universe building even in this graphic novel that screams for sequels! This comic is full of wonderful attention to details, not only in the story, but also in the side details. We have characters in headscarves, in wheelchairs, and who have prosthetic limbs. It’s these small touches that make it not only diverse, but also seamlessly. But if that wasn’t enough, Sanity and Tallulah’s friendship is downright precious. Find Sanity & Tallulah on Goodreads. Buy it for the young reader in your life, but also buy yourself one. Or read it first. I need more middle grade comic book recommendations please! Great review! I had to add this adorable and fun book to my TBR. I love middle grade books like this.